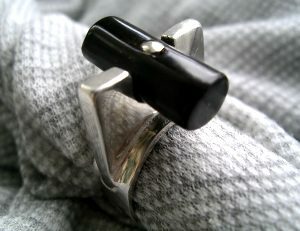 Art Deco inspired sterling silver ring with rare black coral accent. A truly unique piece. 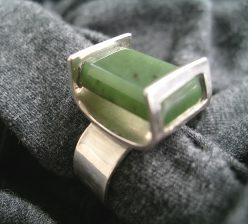 A 1930's style ring designed with a jade stone cut and polished by the designer to fit this unique sterling silver setting. It appears to float on one's finger. A one of a kind design.